I think it’s the right time now to share with you what I like to crochet most. Bags, purses, market bags …………….. This is one of the styles I made. The following two purses are custom made. Not exactly my choice of colors, but definitely an interesting combination. Nice buttons, little flowers or beads. Simply anything you like to decorate your purse with. 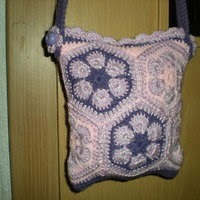 For this purse I made 12 hexagons. For the inside flower I chose four colors – pink, blue, yellow and green. All the flowers are edged with a metallic grey (row 4 on the chart) and white (row 5 on the chart). I made three of each color. It is really up to you how many hexagons you’ll make. As you can see above, I did little purses with 10 hexagons only, the one I am writing about with 12, and even bigger one with 18. It is all depending on size of your purse. The pattern can be use for any amount of hexagons. When I have all the hexagons I need, I sew them together – backstitch only. The other option is to join them together with scs if you like. Then I sew the hexagons together in rows and sew the rows together afterwards. You should end up with sort of tube or cylinder. You can make more or less rounds, as many as you desire. Flatten it out and sew together from inside. Round 5 - ? : Repeat round 4. Leave long tail. Continue with the upper part of the purse now. This part is done same way as the lower part. I added round 13 ( repeat round 5 on B chart above) using metallic grey and I finished with fancy edging (round 14, chart B below for the “white purse”). 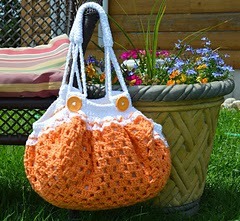 Handles: Make row of ch stitches as long as you need for the handles, sc in 2nd ch from the hook, and sc all the way back. Do as many rows as is needed for the size of the handles you desire. I usually did between 6 and 9 rows. To make the handles stronger I used size smaller hook. I put a lining in the purse. It is optional. The purse is strong enough, but it looks better. I’m adding zippers to most of my purses – better be safe than sorry. If you do so, put the zipper in first. It’s easier to cover it with lining afterwards and it looks much neater. To my knowledge this is as best way I can explain how to make my favourit purse. When I was going through the things I made, I found few that I think you might find interesting and handy as I did. This cute Camera Purse was one of my very first projects. I remember I found the inspiration for it on Ravelry. I looked today and I couldn’t find it any more. I do remember I had trouble making the rectangle look like rectangle. I had to improvise a lot, but it came together OK. All the important things fitted in it nicely. Angel saw this Little Kit-Kat Purse while we were looking at the laptop, and she asked if we could do it right away. I remember it was fun making it, and since I was under Angels constant supervision I finished the purse in maybe not even 2 hours. Looking for my Lip Balm in my purse all the time gave me idea to make this handy holder. Owl Key Chain looks nice on any bag or purse. The big blanket is finished, and I have started new project. 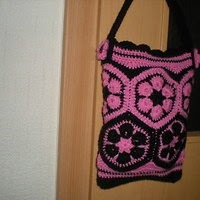 I found a pattern for this Purse. It is not exactly my choice of colors, and I would choose different handles, but the idea is fantastic. I have made some changes and started on it already. I still don’t know what I’m going to do about the handles, but I’m sure I will come up with something. I’ll keep you posted on my progress. I found another beauty in my grandma’s attic. The patterns I’m finding are just beautiful, but in very poor condition. Having been stored for a long time, they are all yellow and hard to read. This is my, a little bit improved, version. Row 1: ch 37, dc into 4th ch from hook and follow the chart. Repeat rows 3 to 18 as many times as needed, until you reach the length required. Very inspired by Attic24 I would like to show you today the wreaths and buntings I decorated my home with. This wreath, full of roses, hangs on my kitchen wall. This other one is very nice in my hallway. I love that birdie. For the living room I chose triangle bunting. I couldn’t forget Angel’s room. This cute little birdie was so sweet. Back in the kitchen, there was still a space for little something. This heart garland was just it. I got so excited about the buntings and garlands; I even came up with my own one. I made five triangles, blocked them, and sprayed them with the water with drop of starch in it. Then I left them to dry. Afterwards I simply sewed them together by picots. You may crochet them together as you go. I also made a few chain stitches on each side of the garland, which made it easier to pin it to the shelves. Finally I finished my ripple blanket. It took me nearly three months of more or less intensive crocheting. The biggest problem I had was the edging. I just wanted to come up with something special, and I think I did – I added little beads into the top and bottom of blanket. 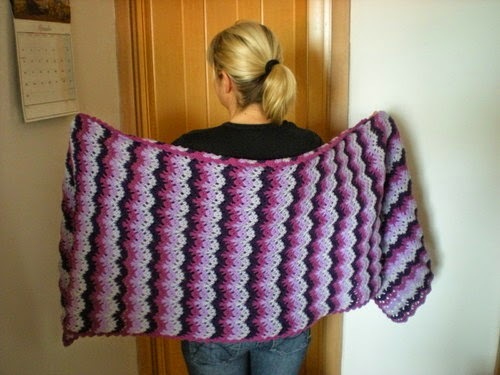 There it is, and I proudly call it: “Soft ripple blanket“. I used 1kg and 100g (2lb 8oz) of soft acrylic baby yarn suitable for E-G/3,5-4mm hook. There are so many variations of the ripples. I chose to follow Sucrette’s chart for mine. I chain 210 + 3, than I made two rows of dc’s with the same colour, repeating six colours over. All together I did 158 dc rows. I used edging with the beads. Just one thing, be careful what kind of beads you are using. Make sure that they are not too fragile, not too big or small and they are colourfast. First I crochet on the longer sides sc-ch2 sideways into every dc, then on both sides from the right side of the blanket. With a needle I manage to put the beads on the yarn and started to slst them very loosely to the top of the blanket, again from the right side of the blanket. Don’t cut the yarn on the end of the row, keep going around to the side and keep crocheting 2hdc into ch2 from previous row. Continue to the end of the side. Do the bottom the same way as the top, and keep going to other side. I have to stress again all the edges are crochet from the right side. Today I would like to continue showing you the wraps, cowls, scarfs and hats I made earlier. I found this Ripple wrap and really liked the colours. It does have grayish colour in it, and I don’t know why I’m using gray so much. Some people can say the colour itself is well, a little bit boring. But in combination with any other colour is interesting to use. And after all, there is not one shade of gray. I simply like it. And it suits me. At least that what I think. What I like about this wrap pattern, is that it can be used for all sorts of other things. Blankets for example. My mum bought new coat and needed scarf to go with it. I came up with this model. I liked making it, because it went very fast and learned, for me, a new stitch. Last year I found that I had a lot of thick yarn hidden all over my house. Since it can get very cold in this part of Europe, hats and cowls are always handy. All the hats are made based on “bucket hat“ pattern from Ravelry. The cowls are made with a simple stitch, as you can see on the picture. You just have to decide, how big it should be, and then make a long row of chain stitches. An even amount. The cowls are worked in a circular crochet method. Slip stitch join at the end of each round. Don’t turn, but continue in same direction. The Rainbow scarf I liked so much, I had to make a slouchy hat to go with it. Pattern notes: The hat is worked in circular crochet method, beginning at the top center of the hat, and ending up with edge of hat. Slip stitch join at end of each round. Don’t turn, but continue in same direction. Row 7: ch3-dctog. in same dc, ch1, sk dc, *2dctog into next dc, ch1, sk dc* rep., slst. For the border I changed the hook for size 4mm. I like using the elastic thread. You cannot see it, and it holds the hat firmly and comfortably on the head. Secure and tidy up the loose ends. And there it is. Simple slouchy hat, which is matching my shawl. In moderation this pattern can be used for all sorts of projects. I’m not neglecting my existing ongoing projects. I’m just working slower than I thought. There are so many more patterns on my mind, I’d like to try, but first things first. Even not finished it is getting used by my Angel. Now I just need to figure out what I’m going to use for border. I’m getting there. And it did get easier as I got to repeat the pattern over and over.